The “MTB's”, as they are called, were built at the Friedrich Lürssen shipyard in Vegesack-Bremen in northern Germany. They were sent for repair at the shipyard "Gl. Horse Hauge" in Svendborg during the war (WWII). By the end of the war there were seven motor torpedo boats at the shipyard. The Germans themselves towed all seven of them out into Lunkebugten and sank the boats in the first following days after May fifth 1945, in order not to fall into the hands of the Allied Forces. Four of them have been located and two were raised or blown up right after the war. During the war there were built 230 Torpedo boats. Length: 32.7 meter. Tonnage: 102 tons. 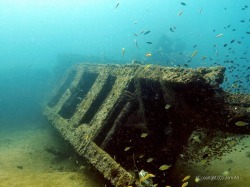 The wrecks are located at 6-8 m of water. The King Cruiser was originally a car ferry in Japan before being used to transport passengers between Phuket and Ko Phi Phi. On May 4th, 1997, the ferry hit dive site Anemone Reef and quickly sank. All the passengers were rescued by nearby dive and fishing boats and there were no casualties. 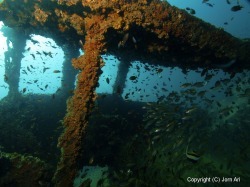 The steel wreck has now evolved into a fantastic natural reef and is home to a huge variety of marine life, who seek shelter within it.The wreck is 85 m long by 35 m wide, and has four decks with large walkways and windows. The Wreck lies perfectly upright at 32 metres, with the captain’s cabin at 12 metres. Due to the beautifully warm tropical waters , the internal structure of the boat is weakening and the wreck is now considered unsafe to penetrate. Boonsung Wreck started her days with her sinking in 1984. 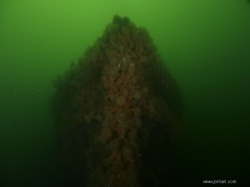 The wreck is an old tin ore processor that is 60 metres in length, 12 metres wide and 6 metres high, and lies positioned in a north to south direction, in open sea but quite close to shore. During the 2004 tsunami, Khao Lak was badly damaged by big waves. The wreck too suffered a lot of structural damage and now lies, still easily recognisable but broken into 5 major sections.